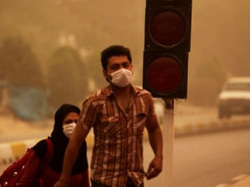 The oil industry in Ahwaz causes massive amounts of pollution through some of its many refinements. Oil refinement uses many resources and has many byproducts after the crude oil is used for gasoline and other petroleum products. Sulfuric acid is one of the byproducts created from petroleum can cause acidic precipitation and also create more acidic surface water. This is a primary pollutant source of SO2, or sulfur oxides. This causes respiratory diseases and even heart disease, also causing plants harm due to the acid precipitation. Automotive emissions are an extremely large part of air pollution today. Automobiles and other forms of transportation emit pollutants such as CFCs, NOx, Carbon Monoxide. These airborne chemicals can use energy from the sun's radiation to break down ozone in the stratosphere, which in excess could cause climate change. Closer to Earth, these primary pollutants contribute to smog and effect human health, creating a higher risk of lung cancer and emphysema. Surrounding plant life will cease to exist due to the lack of sunlight allowed through the smog of the city. Industry in Iran his expanded exponentially, but it has created a less than ideal situation for the Iranian people who call Ahwaz their home. Industrial runoff and wastes are released without refinement or containment into the open air over Iran, making the sky not visible to most of the surrounding cities. As you can see to the right, masks must be worn to protect from inhaling significant amounts of pollutant particles and dust. Some of these particles contain VOCs emitted directly by industry, making them primary pollutants. VOCs can cause people nausea, dizziness, and liver and kidney damage. In animals, however, it has been linked to be a cause in cancer along with allergy-like reactions.